First, thank you for everyone who left tips on who I should contact to help with the injured hawk. I also did mucho internet research and ended up finding various resources. I called and left messages for 1) a nature center 15 miles away, 2) a wildlife rescue group in Claremore, Oklahoma and 3) a wildlife rehab gal who I found through the Oklahoma Parks website. I talked to answering machines at #1 and #2. At #3, I talked to the gal's husband, who said she was out feeding animals - he would have her call me when she came in the house. Neither #1, #2, nor #3 ever returned my calls. But thanks to fellow Kansan Moonshadow's recommendation, the hawk finally had a skilled rescuer to help him out! 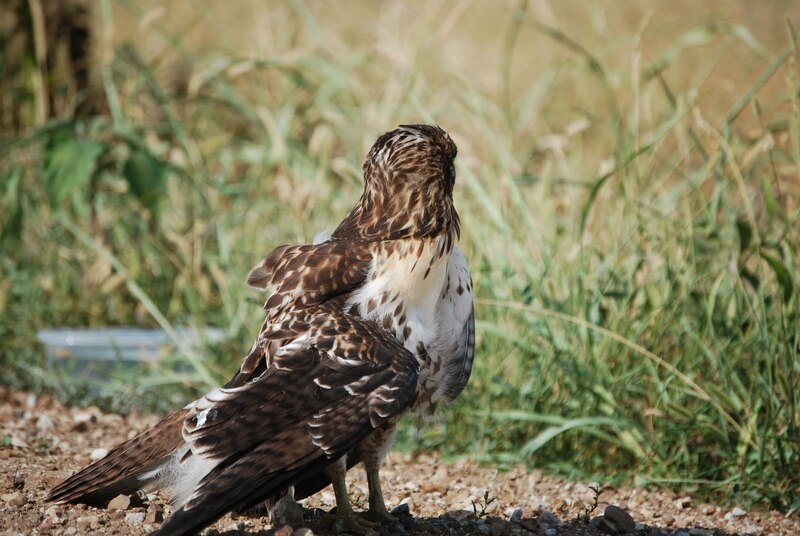 The Eagle Valley Raptor Center in Cheney, Kansas, came to our aid. When looking for a rescue group to help me, I also used my Peterson's bird book to try to identify the hawk. I narrowed it down to a juvenile red-tailed hawk based on the description in the book and what our rescued hawk looked like. I was curious to find out if I was right, or what type of hawk he was. Ken reached into our dog carrier to retrieve the hawk without gloves or blanket or towel. He just reached in to grab him and the hawk did not resist. Needless to say, I had my heavy duty ranch gloves on every time I was in close proximity to the hawk. That was a sharp beak and those talons looked like steel to me. I wish I would have got a better photo showing his talons, which were incredible! Ken confirmed he had a broken wing, and that it was broke up near the shoulder where it connects to the hawk's body. Not a good place for a break. Ken was taking the bird to a vet following our meeting - I can only hope the bird had a good outcome. I emailed Ken the next morning asking how things went, but I have not heard back from him. Between helping the keet hatch from his egg a week and a half ago, and now this, I do think I'm becoming more comfortable with animal/wildlife rescue situations. Oh, and there was that barn owl a few years back that became entangled in fly tape in our shop - click here to check out THAT story. And life goes on. Another week, another opportunity just around the corner. Right? Opportunities abound in Oz Land. :) Thanks for updating the hawk story. I loved it. I hope he's okay too! A day in Oz Land sounds much more interesting and exciting than a day on Long Island. Helping wildlife in even the smallest capacity is just so fulfilling. You done good, girl! I'm glad you found someone to help. I would have been scared to have touched him even with the thick gloves. Good job. How sad that three of them didn't bother to return your call. But I'm happy you found Ken, and it sounds like the hawk is exactly where he needs to be now. I hope it all works out and they can save him. You're a sweetheart for saving that hawk's life.